Elusive Onions: I’ve Created A Monster! As of today, I haven't had a call to work in two weeks. (I expected the phone to ring as soon as I finished writing that. It didn't.) This is the longest dry spell I've had in ages. I'm not sure how I feel about this. Sometimes worried, sometimes relieved. I guess ambivalent would be the best way to describe it. Frustration is another fairly common emotion. Not necessarily frustration with the work situation. I'm frustrated with myself. I feel as though I should be accomplishing great things with all this spare time. I'm not. I'm not even keeping up with the basics, though I did do some cleaning (with lots of help from Hubby) over the weekend. Part of my problem is that nothing in my background prepared me for being a housewife. Not that I'm not familiar with the skills. My parents made sure I had mastered the basics of domestic survival before I left home, but my education focused on preparing me for some mythical career. Lately, that career is feeling more and more like a myth. The weekend's cleaning session gave me the opportunity to think. As I scrubbed my completely grotty bathtub for the second time – the first time didn't take – I decided that if current circumstances have made me a housewife, I may as well be a housewife with a good attitude. I will embrace my housewifeliness with gusto and embark on my new path with a spirit of adventure. That attitude found me out of bed and in the kitchen before 6am. That on top of the time change. Right. We'll see how long this lasts. So what was I doing in my kitchen at that unearthly hour? Well, first I cranked up the oven and baked a spaghetti squash for tonight's casserole. Meal planning – score one for the domestic goddess! Then, while that baked, I made bread. What could be more housewifely than homemade bread? Of course, for a while I wasn't sure if what I had created was going to be bread. 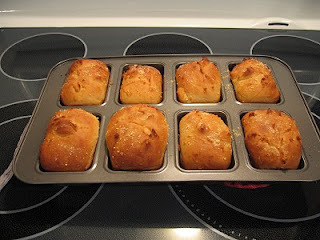 I found the recipe for English Muffin Bread in a cookbook I've had for ages: Breaking Bread with Father Dominic. The whole book is about bread making. Apparently I've been considering making my own bread for a long time. The recipe looked pretty straight-forward. I figured that with my marvelous mixer it would be a snap. Things came together quickly. I even managed to heat the milk without scorching it. The recipe didn't call for kneading, so I knew I wasn't going to get typical bread dough. After five minutes of mixing I was supposed to have a "slightly stiff batter". It was beyond "slightly" stiff, but it still had to rest for ten minutes. I figured the texture would improve after the batter had lounged for a while. I was wrong. If anything it got stiffer. 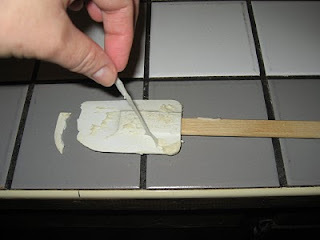 When I tried to "stir down the batter" it chewed the tip right off of my rubber spatula. I was beginning to think I had created a monstrous new life form. This idea was quickly reinforced. After the demise of my spatula I grabbed my wooden spoon and tried to beat the blob into submission. It grabbed back! I could hardly wrestle my spoon out of the bowl, and when I did manage to pry it away the batter clung on with long, stubborn, rubbery tentacles. At this point I was supposed to "spoon batter into prepared pans". I certainly wasn't going to risk putting my spoon back in there, so I went at it with both hands. I needed to divide the beast into eight mini loaves. By the time I finished there were batter-y appendages creeping up past my wrists. 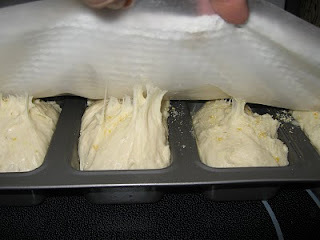 Eventually I got the creature into my mini-loaf pan, and I set it aside to rise. Fortunately I covered the pan with waxed paper before I covered it with a towel. As the batter rose it stuck firmly to the paper. I would have never rescued my towel. While the batter rose I washed the morning's dishes. (My dishcloth was ruined in the process. The bits of dough that were stuck to my utensils are now permanently adhered to my dishcloth.) As I scrubbed I pondered the problems with my bread. Had I forgotten something? Did I over-mix? Under-mix? Was it just lack of experience? Was the monstrous outcome some strange culinary reflection of the religious differences between the recipe's author and the cook? Had I had enough sleep? At the end of the recommended rising time the loaves went into the oven. I didn't have high hopes, but I figured I may as well go ahead and bake them. I'm glad I did. They turned out quite well. They're crispy on the outside and moist and airy on the inside. They aren't as craggy as an English muffin, but I don't know if that's normal or not. 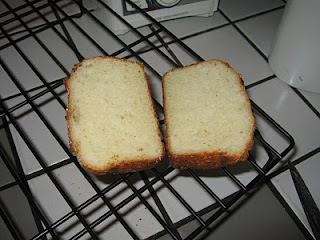 I've never had English muffin bread before, so I have nothing to compare them to. Ultimately, I think it's better that way. Calculated ignorance may be the solution for this reluctant housewife. Notice how tip has been chewed off my spatula. That stringy bit is a wee batter tentacle. I didn't dare get my camera close to any of the larger appendages. More sticky tentacles. The stuff had a life of it's own. Loaves out of the oven. They look promising. Mmmmm. Bread. What a lovely surprise. Thanks Chris. Funnily enough I was thinking of you too! You know, I never think of you as "lost" in the Domestic Goddess world. I always think of you as taking the Domestic Goddess world by storm! Wanna be my hero? Or, if not that, wanna let me come to your house to make bread? I just decided yesterday that I want to try making bread. Sometime after this month when my job ends I should visit you and learn the tricks! Wow Emma. I'm flattered that after reading that you think I actually have a clue! Come on over anyway. Maybe between the two of us we can figure things out. We can certainly have fun trying. Maybe we can enlist Chris to help. Now that I think of it, Hubby is actually the bread maker (and currently the bread winner) in our house. I bet he'll help too. I say again, come on over! Chris, I love how you are taking this suggestion with a grain of wheat! Though, if you consider this to be a useful suggestion for you, go for it. You'll have all that bread-making time to pursue other interests. Like teaching me how to make bread.